Sabrina has been anxious to get back in the kitchen and cook, after being sick last week - then spending the first two days after school got out watching every episode of Spongebob. That's enough to make your brain congeal into cold oatmeal. 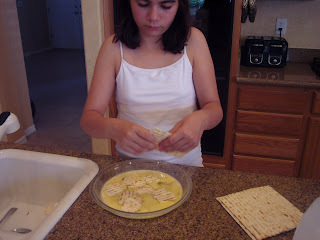 Today she's making matzo brei. 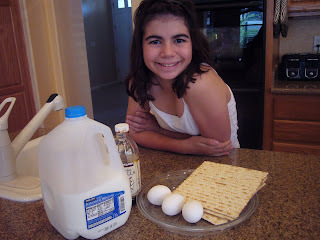 David makes this for them every blue moon (which is to say not very often) so she wants to learn how to make it herself. 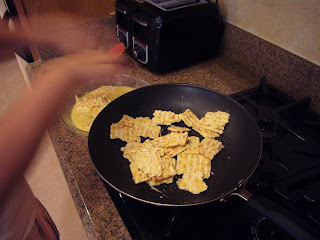 Next, she breaks up 3 matzo crackers into the egg mixture, tosses it together a few times, then lets it sit for a few minutes to allow the egg mixture to soak into the crackers. 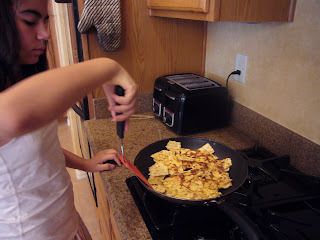 She coats a large frying pan with non-stick spray and puts it over medium heat. 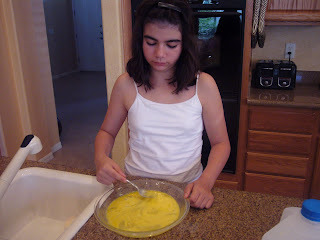 Then she places the mixture into the hot pan and lets it cook for a few minutes. 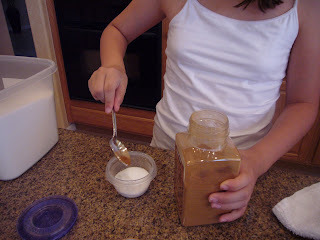 While that's cooking, she mixes sugar and a pinch of cinnamon. 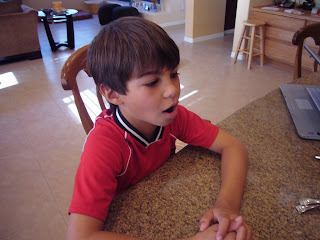 Here's Alexander when he saw what was for breakfast. 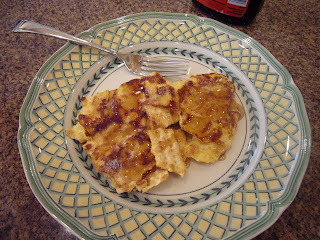 A sprinkling of cinnamon-sugar, and maple syrup, and breakfast is done!